Well, I'll say one thing for Tony Faber: he doesn't put himself into his writing. Not one "I" anywhere. Which is kind of frustrating, because I kept getting the feeling that he was somehow connected to the famous Fabergé, given his last name. There was also frequent mention of a London shop, Faber & Faber. Given that the author is British, I figured he must have some connection to it. Alas, not a word. This book is purely for people who (like me) are enthusiastic about Russian history and/or have a fetish for garish, ornate regal objects. Especially ones with murky histories and strange tales. 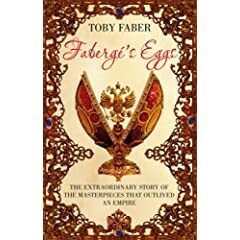 The first part of the book was excellent, chronicling how Fabergé made his annual Easter eggs, presents from the Tsar to his wife and mother. And oh, how I wish I could see one after reading the detailed descriptions and seeing their photos. The book was also kind of sad, considering I knew how the ending would go for the Romanovs. It's like watching a horror movie and screaming at the main characters, "Get out! Save yourselves!" Even when you know it's inevitable. The novel gets weighed down, however, after the Bolsheviks take over and the eggs scatter to the four winds. Some have never been recovered, some stayed in the Kremlin, and others made strange and convoluted journeys to their present homes worldwide. (One egg belongs to the Emir of Qatar, two are Queen Elizabeth's and a great number are in museums in the States. Who knew?) Although it's fun to play detective and retrace each egg's steps, I found in some cases there were just too many steps and too many names and stories to remember. It's exciting to think that there is a very strong possibility of some of the missing eggs turning up some day. I'll leave you with a link to one of my favourite of Fabergé eggs, The Winter Egg. Not only is it absolutely stunning and considered to be the best of all Fabergé's eggs, it was actually designed by a 25-year-old woman who worked for Fabergé named Alma Pihl. I rate this book 30 Fabergé eggs out of fifty.